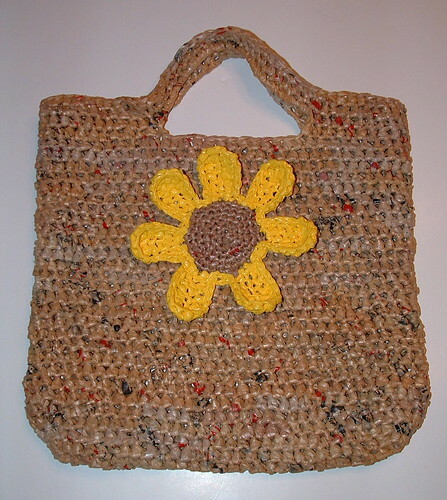 Here is my recycled plastic bag tote that features a crocheted sunflower. The tote bag is crocheted using recycled plastic bags or plarn and then the sunflower embellishment is added. 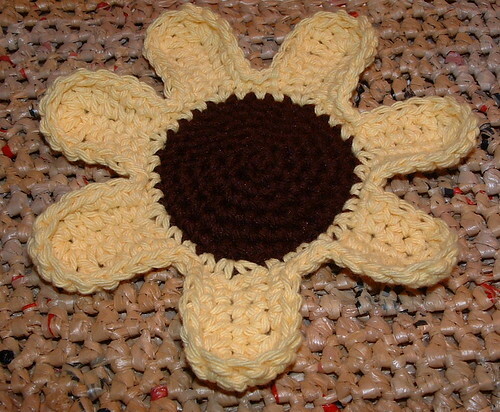 I created the sunflower crochet pattern using both plastic bags and regular cotton yarn so it could be done in either type of material. 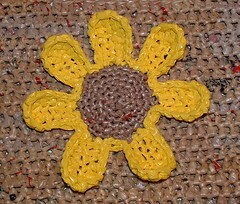 Here is the recycled plastic tote bag pattern and below you will find the free pattern for the sunflower. Here is sunflower I crocheted using just a bit of brown and yellow cotton yarn. 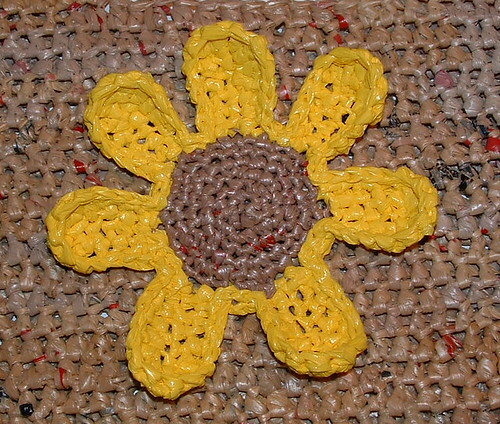 So whether you are working with recycled plastic bags or regular yarn, you can crochet this cute sunflower to attach to a tote bag, purse or even use it as a hotpad. This project is worked in the round without joining unless otherwise advised to do so. Use stitch marker to mark the beginning of each round so you know where each round ends. Sc in each st loosely and join with Sl St into beginning Sc. Weave in tail in next st to finish with a smooth edge for your brown center. Leave a length of the tail under the center so you can use it to attach to your tote bag later. The petal portion of this pattern varies if you are using plastic bag yarn (plarn) or regular cotton yarn. Please read carefully row 1 as you proceed. I have written the changes for regular cotton yarn steps after the plarn pattern instructions. Join yellow plarn in the last st with a Sl St *Ch 6, in 2nd chain from hook Sc in next 5 sts of yellow chain, then Sl St into the brown beg st of row (same st here you began petal). Sl St in each of the next 4 sts along the brown edge*. Repeat between * back to the beginning and end with Sl St in the 2nd to last stitch and skip last st in brown so your spaces are even around 7 petals. Join yellow cotton yarn in the last st with a Sl St *Ch 6, in 2nd chain from hook, Sc in next 5 sts of yellow chain, then Sc into the brown beg st of row (same st here you began petal). Sc in the next 4 sts along the brown edge*. Repeat between * back to the beginning and end with Sl St in the 2nd to last stitch and skip last st in brown so your spaces are even around 7 petals. The remaining rows are all worked the same regardless if you are using plarn or regular yarn. *Sc in 1st st of petal, Sc in next st, Dc in next 2 sts, 2 Dc in top st, Dc in next 2 sts, Hdc in next st, Sc in last 2 sts of petal. Sl St into 1st beg st and Sl St over to next petal*. Repeat between * back to the beginning and join with Sl St at end. *Sc loosely in ea st of petal and Sl St across to next petal*. Repeat between * back to the beginning and join with Sl St at end of last petal. Petals curl as designed to in this pattern. Weave ends under and leave a tail so you can attach your sunflower to the tote bag or other item that you may want to embellish. Very cute! I like the cotton flower more, because it is matt against the shiny plarn bag. I’m going to have to add this to my queue. I really like the flower. Do you find that working with yarn is more difficult on your hands? Working with the plastic bag yarn is harder on your hands and joints. The regular cotton yarn is easier. Hope you try the pattern out and let me know how it turns out. 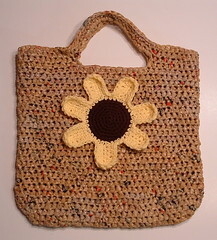 Wanted to let you know that I’m featuring your sunflower bag on my blog in an article that will be published on February 13, 2012. Wow!! I never imagined bags made from plastic bags could look this good!